Reading dog food labels can be tricky. 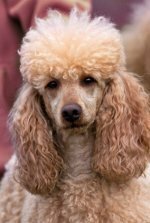 It's important to know what is in the food you are feeding to your poodle and what the dog food ingredients are. Just like people food, a poodle food label lists the most ingredients first tapering off to the least ingredients. Meat protein - chicken, turkey, lamb and beef - should be in the top 5 ingredients. Meat byproducts also have vitamins and minerals needed to keep your dog healthy. Make sure meat products top fillers in the dog food. Grain fillers include corn, wheat, rice and soy and are used for bulk. Fillers give carbs and a little protein to your dog. Be aware that soy can give your dog gas. You'll find corn in most dog food. This, along with wheat and soy can cause dog food allergies. Watch him when he eats dog food to see how he reacts. It may be a better idea to buy organic or make your own food for him. Or try a food with rice fillers. Rice may be easier on his belly, and to digest, than corn, soy and wheat. 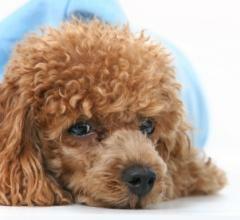 If chicken is the meat protein in a dog food, your poodle's fat will come from that. The food label should specify the fat type. It will also list the preservatives in the food, which keeps the food from quickly spoiling. 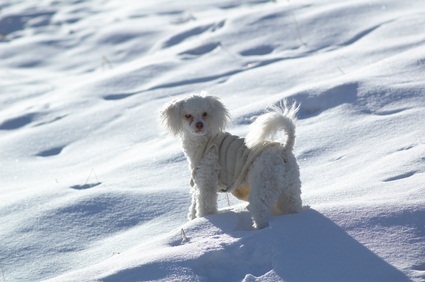 Like people food, try and find food for your poodle that does not have a lot of preservatives. The guaranteed analysis on the label gives you the percentage of protein, fat and fiber ingredients. Active dogs need higher protein while obese dogs need less fat. Stay away from dog food which has a lot of fillers, artificial colors and preservatives. Your puppy and adult dog will be as healthy as the food ingredients that go into his body.